Pokerstars have finally started to run satellite qualifiers for the 2010 World Series Of Poker – becoming the last major poker site to release their schedule. The largest poker site online are aiming once again to send the most online qualifiers to Las Vegas. In addition to offering multiple routes to winning your WSOP package, Pokerstars are offering further benefits to those players who participate in the Main Event itself, rather than taking the cash equivalent. This includes a free entry to the Pokerstars Caribbean Adventure or North American Poker Tour tournament of your choice for players who make the money in the World Series wearing Stars logos. Key qualification routes include Steps SNG tournaments. Here players finishing in the top places in low buy-in SNGs win tickets to the next level. Once you work your way to ‘Step 6’ you are playing for the prize of a $12k package. Runners up receive ‘try again’ tokens, ensuring that these games are great value for money. Multi-table tournaments send literally 100’s of players from Pokerstars to the Main Event each year. Players with smaller bankrolls get an opportunity to ‘qualify for the qualifiers’ this year, with a huge range of satellites starting at just a few dollars. 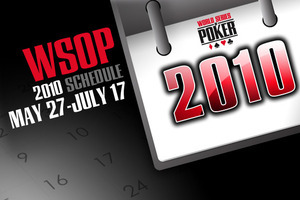 The regular $700 events award seats – many of these tournaments guaranteeing a fixed number of packages. With the qualification schedule newly released, we do not yet have details of the ‘super-satellites’ for 2010. These big-field poker tournaments guarantee 100’s of packages – and attract massive fields. In previous years the size of these events has warranted a separate press release of its own – remember to bookmark Poker News Boy today, as we will bring you the news as soon as it is in. Freerolls, VIP Club qualifiers, ‘Double Shootouts’ and hyper-turbo qualifiers are all expected to be added to the schedule soon. We think the world’s biggest poker site offer you a great opportunity to qualify for this year’s Main Event – click to visit Pokerstars now and win your seat! Remember to use a PokerStars Referral Code when signing up as well to get a $600 deposit bonus. This entry was posted on Wednesday, May 19th, 2010 at 5:36 am and is filed under Poker News. You can follow any responses to this entry through the RSS 2.0 feed. You can leave a response, or trackback from your own site.